The BepiColombo mission to Mercury is scheduled to launch aboard an Ariane 5 from Europe’s Spaceport in Kourou, French Guiana at 01:45 GMT (03:45 CEST) on 20 October 2018. Representatives of traditional and social media are invited to apply for accreditation to follow the launch live from ESA’s mission control centre in Darmstadt, Germany. BepiColombo is a joint endeavour between ESA and the Japan Aerospace Exploration Agency, JAXA. It is the first European mission to Mercury, the smallest and least explored planet in the inner Solar System, and the first to send two spacecraft to make complementary measurements of the planet’s dynamic environment at the same time. It will build on the discoveries and questions raised by NASA’s Messenger mission, which orbited the planet between 2011 and 2015, to provide the best understanding of the Solar System’s innermost planet to date. BepiColombo will provide information about solar system evolution in general – not just about our own, but regarding how planets orbiting close to their stars in exoplanet systems form and evolve, too. 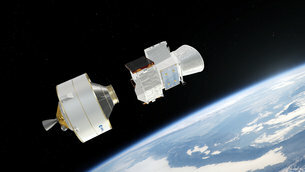 The mission comprises two science orbiters: ESA’s Mercury Planetary Orbiter (MPO, or ‘Bepi’) and JAXA’s Mercury Magnetospheric Orbiter (MMO, or ‘Mio’). The ESA-built Mercury Transfer Module (MTM) will carry the orbiters to Mercury using a combination of solar electric propulsion and gravity assist flybys. In an ambitious seven-year flight, the mission will make one flyby of Earth, two at Venus, and six at Mercury, before entering orbit. A big challenge for the mission is the Sun’s enormous gravity, which makes it difficult to place a spacecraft into a stable orbit around Mercury – even more energy is needed than when sending a mission to Pluto. After launch, and having escaped the ‘gravity well’ of Earth, BepiColombo must constantly brake against the gravitational pull of the Sun. Ion thrusters on the MTM will provide the needed low thrust over long durations of the cruise phase, and employs technology demonstrated previously in ESA’s GOCE mission to study Earth’s gravity and in the SMART-1 mission to the Moon. The high solar intensity experienced during the journey and later during operations at Mercury also demanded new technologies to be developed – such as high-temperature coatings and multi-layered insulation, a radiator for the MPO, and a novel spin-technique for Mio – to avoid overheating. During the cruise phase, however, Mio will not be spinning, so it is protected by a sunshield. The orbiters will be able to operate some of their instruments during the cruise phase, affording unique opportunities to collect scientifically valuable data at Venus, for example. While it will not be possible to use the scientific camera on the journey, three monitoring cameras fixed to the MTM will provide visual confirmation of the successful deployments of the solar arrays and antennas following launch, as well as snapshots during the planetary flybys. Experts will present the mission, its challenges and scientific goals during a dedicated programme for media at ESOC, which will include viewing the webcast from the launch site in Kourou. 03:00 Programme begins: Scientists and mission operations experts present the mission, with live transmissions from Kourou including the moment of launch at 03:45 CEST. This will be followed by the announcement of acquisition of signal from the Main Control Room, expected around 40 minutes after launch. 05:00 End of event – media invited to join team breakfast with representatives of ESA, industry and the scientific community. Social media should register by Friday 12 October at the same link as above. Note that there is no dedicated social media event; those attending with social media accreditation will have the same access to the event as traditional/online news media. Social media participants should check here that they meet the eligibility criteria before applying. There are a limited number of places for social media participants; successful applicants will be informed by Monday, 15 October. For live updates throughout the launch period, follow @BepiColombo, @esaoperations and @esascience on Twitter. The three spacecraft modules also have personalised accounts (@JAXA_MMO, @ESA_Bepi and @ESA_MTM); follow for extra content and a unique take on the mission. Note that images from the MTM’s monitoring camera, showing the deployed solar arrays of MTM, and of the MPO’s antennas, will only be taken approximately 12 hours and 1.5 days after launch, respectively. They will be shared on esa.int/bepicolombo and from the @ESA_MTM account on Twitter in the first instance, once available. A media kit will also be published via the above URL.